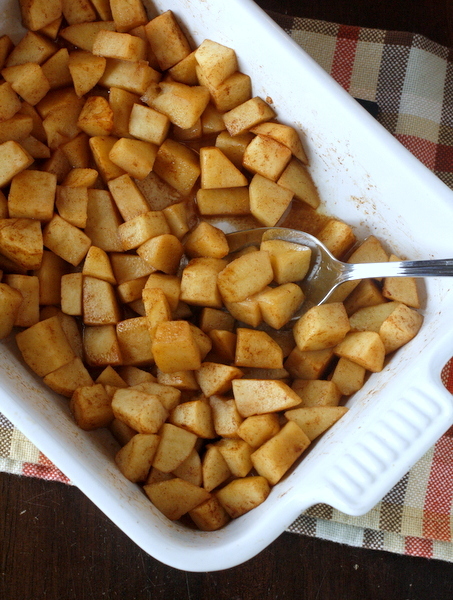 These simple and healthy baked apples make a perfect kid-friendly side dish or snack for fall! You are going to love these baked apples! This recipe is so simple to prepare and even better, the end result is both healthy and delicious! I am always trying to find new recipes to help my kids eat more fruits and vegetables. The bigger two are usually pretty happy to munch on crunchy apple slices, but the little two do a little better with softer fruits. We went apple picking last weekend and came home with lots and lots of apples, so I knew I needed to find a way for the whole family to enjoy our apple abundance. The kids LOVE homemade applesauce (<– link to our favorite recipe!! ), but I was ready to try something a little easier for our babies to feed to themselves. That’s where these cinnamon baked apples come in! 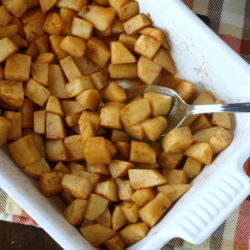 The apples are cut into bite-sized pieces and baked with a little butter and cinnamon until soft. Perfect for little hands to pick up and eat! I served this as a “treat” for the kids so I added a tiny bit of sugar, but you can easily leave that out to make it even healthier or if serving as a side dish. This would make a delicious side dish to serve with pork or ham, or you could even serve it for breakfast with some yogurt and granola. Yum!! 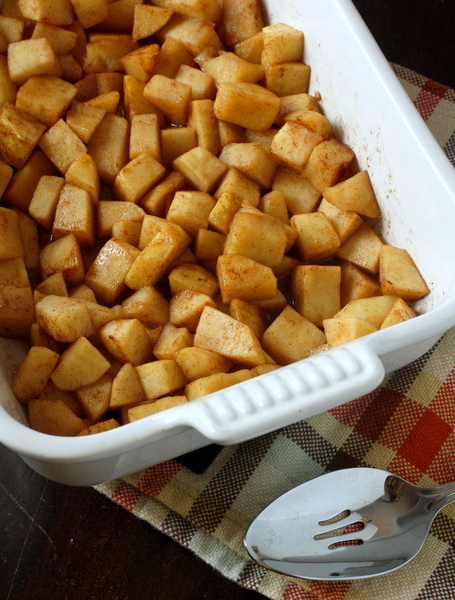 This would also be a good recipe to help you use up any apples that are bruised or past their prime. Just cut off any bad spots and continue with the recipe! These baked apples really do make a perfect baby food as well. Emmie ate them right up and had no problem picking up the pieces and getting them to her mouth. You could even make these ahead of time and re-heat them to make it even easier for quick meals! My house smelled so good while the apples were baking. 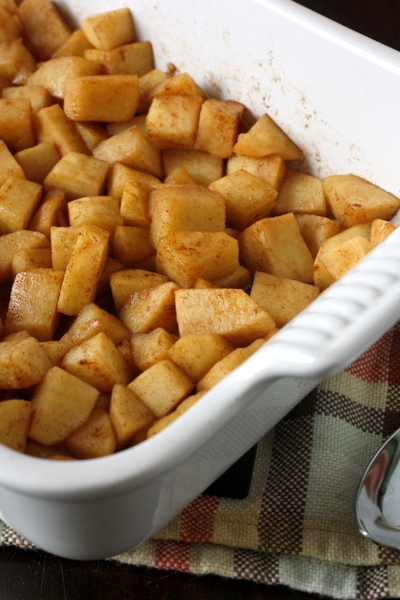 There isn’t much better than the smell of cinnamon apples in the fall! I hope you try these healthy baked apples – we will definitely be making them often! Preheat the oven to 350 degrees. Lightly grease a medium sized baking dish and set aside. 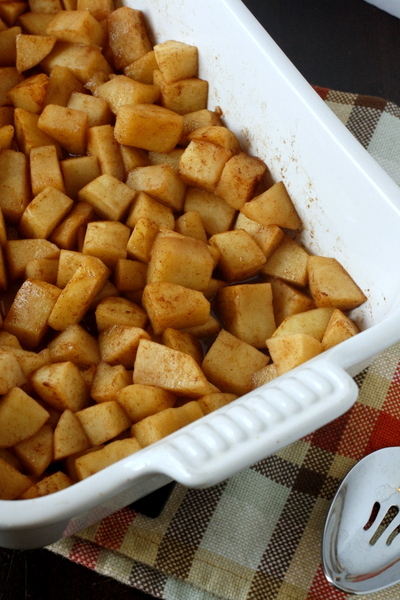 In a medium sized bowl mix the apples with the butter, cinnamon, and brown sugar. Toss well to coat all the apples evenly. Pour into the prepared baking dish. Bake, stirring halfway through, until the apples are soft, about 30-40 minutes, depending on the size of your apple pieces.